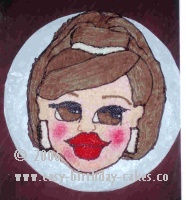 With an icing filled bag and round tip, size #5, draw the face on the cake top. Use a star tip, size #18 and white icing to fill in the whites of the eyes, the earrings and the hair band. Now, make brown icing and using the same size star tip, fill in the brown part of the eyes. Make black icing and using the same size star tip, fill in the pupil of the eyes. Make red icing and use star tip, size #18 to fill in the lips. Make a light flesh color icing and use the same size star tip to fill in the face. Use your brown icing and round tip, size #5 to outline the nose and do the eyebrows. Change the tip to the basket weave tip, size #48 and fill in the hair. Use your black icing and the round tip, size #5 and do all of the outline work. Don’t forget the eyelashes. Refer to the picture of the Bratz cake when needed.